Congratulations! You’ve made it over the first two hurdles – finding an opening that suits both your interests and qualifications, and securing an interview with the company. Now comes the make-it-or-break-it moment that can send even seasoned veterans into a state of nail-biting nervousness: the interview. Relax! Below are ten tips for interview success, courtesy of Molding Business Services. Follow these suggestions for putting your best foot forward and you can rest assured that you’ll never lose out on a position just because you flunked the interview. Try to grab the mid-morning, mid-week spot. According to Glass Door’s job-hunting blog, research shows that Tuesday morning at 10:30 is the best time to interview. At that time, you avoid both the beginning and end-of-week rush, and it is late enough in the day that you and the interviewer are both awake and alert, but it isn’t yet verging on lunch-time when low blood-sugar can cause lapses of concentration or the end of the day when other responsibilities can press. If a time such as this isn’t offered, the next-best choice is to take the first opportunity available, as it demonstrates your eagerness to meet and allows you to make a first (or at least early) impression. Understand that your interviewer will also know you. Online employment advisor Career Builder reports that more than 60% of employers use social media to research candidates. An even larger percentage use a search engine. And, over 40% are less likely to hire someone who has no online presence! But, make sure any online profiles from LinkedIn to Instagram portray you in a way you feel comfortable presenting to employers. Almost 50% of hiring managers who screen candidates on social media say they’ve found something that has kept them from offering a person the job. Use your recruiter. If you’re lucky enough to be working with a recruiter, make sure you’ve gotten every ounce of useful info out of that person. Recruiters often have inside info, or can offer advice, ranging from “this company emphasizes a team culture,” to “wear a tie to this one,” to “the manufacturing manager is kind of a tough nut, so be prepared.” If you aren’t working with a recruiter, consider if you have any other networking possibilities. A friend or former coworker may just have an insider tip that could help you out. Prepare for the “what is your biggest weakness” question. This old standard isn’t asked simply to find out what you aren’t good at, but to discover how you have dealt with the situation. Don’t say, “Well, I’m really not that good with Solidworks.” Instead, say, “For a while, I was intimidated by new software, but I realized I just needed to dive in and I’ve really been picking it up quickly since then. It’s helped me realize that, often, our anxiety over a problem is worse than the problem itself.” Turn this question into an opportunity to show how you’ve grown. If you aren’t sure you have grown on an issue, don’t pick that one to talk about. That’s the point of the preparation. 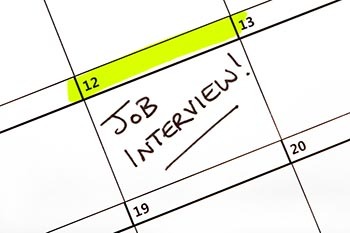 Be early for your interview. Five to ten minutes early is perfect; more than that is too much. Prepare to arrive even earlier, so that you can walk in the door about eight minutes before the scheduled time. Do not be late. Employ good nonverbal communication. What you say in an interview is only a part of your presentation. Humans are more sensitive to nonverbal cues than to verbal ones. Every second of an interview, you are sending a message about yourself to your interviewer, so make sure that you are saying what you intend to say. Stand up straight, make good but not excessive eye contact, use a firm handshake, be calm but positive and pleasant. Smile, sit back in your chair, and don’t fidget. You want to present the picture of a competent, confident person who will get along easily with others. Establish a connection with the interviewer. Another truth about humans is that we like those with whom we have similarities. Finding any kind of common ground with an interviewer is a great way to leave a positive impression outside of your qualifications. If you have something in common that you’ve established in the first two minutes of conversation (perhaps you both have children who play baseball, you are from the same part of the country, or maybe you both have the same fitness watch) then you have a great place to start. But, sometimes it is harder to find a shared interest, especially if your interviewer is not chatty. In this case, let the non-verbal communication be your common ground. Take cues from your interviewer on style, pace, level of familiarity, even body language. Follow up. Your last responsibility is to thank your interviewer for his or her time at the end of your in-person meeting, and then to send a brief note within two days restating your appreciation Many people suggest a true thank-you note in the mail, but we think that an email is enough (if you have the interviewer’s email address). Make sure to keep the tone of the email formal, the format official, and the text brief and to the point. After that your work is done. Unless you were specifically told to call, do not contact the interviewer or the company again. Waiting can be agonizing, but being impatient will not help your chances. Incorporate these recommendations into your interview style, and you can relax knowing you’ve done your best!